Ann Stubbington - The Devil's Dress | Vault Of Evil: Brit Horror Pulp Plus! 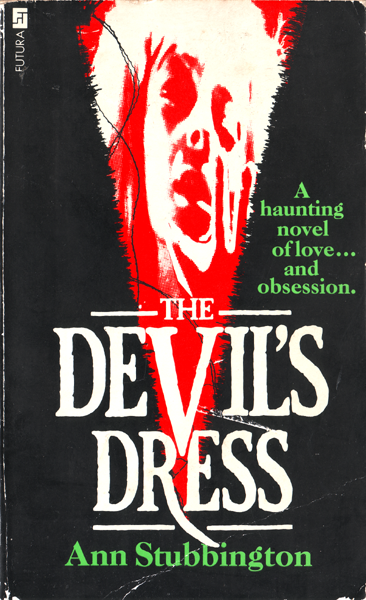 Its doubtless not the book you had in mind, but there is a novel called THE DEVIL'S DRESS by Ann Stubbington. I haven't read it but I know of it because the author is/was married to the war writer Colin Stubbington who was my next door neighbour but one when I was a lad. Good books he wrote too. A haunting novel of love ... and obsession. It looked like a rather ordinary, drab old dress. Anyone else would have passed it by, left it to rot in the antique shop. But when Cass touched it, unfamiliar sensations rushed out to intrigue her - feelings, memories, sounds of another time and a different, distant place. She had to have it. Finally landed a copy, began it last night. Cassie and Graham are shown around a large Victorian property in usual quaint English village. As the estate agent gives them the guided tour, Cassie, psychic from her childhood, gets powerful vibes from a bannister. Someone either fell or deliberately threw themselves down this staircase. Despite her discomfort, Cassie decides this is the home for her. Graham feels the same way. Shortly after the house-warming, Cassie identifies two resident ghosts. A young woman dressed in the costume of a parlour maid, and, presumably, her mistress, a strikingly handsome creature in a drab brown dress. Cassie comes to haunt the village antique shop. Today she's lured inside by a window sign advertising "Victorian clothes - £1." Cassie roots through a trunkload of oddments, nothing of interest, but then she spots it draped across a chair - battered as it is, she must have that dress! The proprietor tells her the garment came with a job lot of furniture he bought from the Grey House up on the hill, the 90-year old Lady of the Manor having recently passed away. It was concealed in the secret drawer of a wardrobe. Back home with her purchase, Cassie runs across her hands over the fabric. She is transported to a field on a blistering hot day where a young woman, Psyche, is basking in the attention of a male admirer. Cassie decides she is going to enjoy getting to know the previous owner of her dress. A slight alteration, a stitch here and there, and it will be ready to wear. A quick and easy read, supernatural melodrama as opposed to horror story for the most part. The problem is, Psyche is no devil. More sinned against than sinner, she's the beautiful, overindulged daughter of a Kentish squire, who falls foul of a rakish cousin, Alex. When, inevitably, she winds up pregnant, everyone, especially Dear Papa, turns against her. Cass, who buys her dress, is probably intended as a sympathetic character, but I couldn't warm to her. She loathes "the era of the common man," with its comprehensive schools, housing estates, "pop" music and human rights - for anyone beside herself - and longs to swap places with the woman who haunts her dreams. Oh, for Empire!, etc. Needless to say, she eventually gets her wish, but will either party be any happier for the exchange?